Have you heard about epoxy pipe lining and think it will be a good solution for your home? Thankfully, understanding epoxy pipe lining is easier than expected, and Accurate Leak has technicians that can guide you through our process. 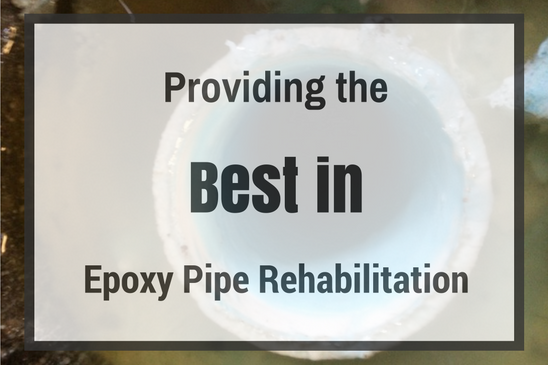 Once customers have an idea of the process, pricing and outcome, they find that small leaks and major plumbing renovations are made easier with epoxy plumbing and sewer pipe linings. When new technology is introduced, it helps to be able to ask as many questions as possible. This is why we train our technicians to describe the process we use to re-line pipes with epoxy with the most accuracy possible. Unlike some technology, pipe re-lining is a simplified process, and once you see our machines, understanding epoxy pipe lining makes more sense. In many cases, property owners overestimate their needs, and find that they only need epoxy pipe liners in a couple of specific areas instead of a total renovation. This saves a significant amount of time and money because the need to fix one pipe obviously costs less than placing epoxy liners throughout the entire property. 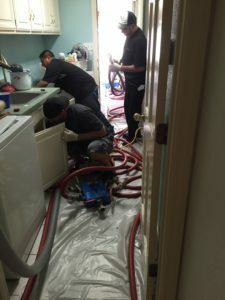 Nevertheless, in all relining situations, the homeowner always saves on costs related to traditional methods of pipe replacement such as digging up the yard or breaking apart walls that will need to be rebuilt. When you find that there are serious issues in your home with the plumbing, it can be extremely difficult to pay for an entire home renovation. This includes water intake pipes, but also sewage pipes. Our techniques allow us to find all of the areas that are affected by using specialized equipment to find areas of pipes that do not hold air pressure. Once we identify the damaged areas, we can isolate repairs. This not only saves time, but also a significant amount of money compared to traditional plumbing techniques. Many homeowners seek out epoxy pipe relining because they find out that it is Navy patented and FDA approved. The epoxy coating for pipes was first used in Europe over 40 years ago, and the ability to restore aged copper water piping systems quickly caught the attention of property owners. Sadly, epoxy pipe relining was not on the American market until recently, but the main reason it is catching on is due to the low cost and decades-long durability it provides. In addition to the cost and time savings that cure-in-place pipe lining provides, a side effect is a cleaner environment. This is particularly important for homeowners that have young children or people living with disabilities in the home. With traditional methods of plumbing repair, the removal of walls, floors or ceilings often stirs up a lot of dust that can make the air in the living space hard to breathe for several days. With epoxy pipe replacement methods, the pipe access areas are often limited or do not require cutting the walls. Whether you have a pinhole leak that has just been discovered or a sewage/plumbing emergency that has caused serious damage to your home, Accurate Leak is the solution you are searching for. We have the quality repairs that will save you money in the long-term, and the reassurance you are protected for decades in the future puts your mind at ease. 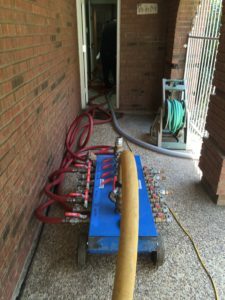 Our Accurate Leak and Line specialized technicians Juan, Juan Carlos and Andreas setup epoxy pipe rehabilitation equipment at a residential homes throughout the Colleyville, TX area. To reassure our customers, Accurate Leak and Line provides an extended warranty on complete system replacement and rehabilitation. To find out more about what we have to offer, give Accurate Leak a call today. Thank you in advance for choosing us, and we look forward to hearing more from you.